People don’t want to talk about dying. In 2015, according to the Funeral and Memorial Information Council, 69% of adults over the age of 40 indicated they would prefer to pre-arrange their funeral but only 17% actually did so. Conversely, there’s been a dramatic increase in the use of advanced medical directives. 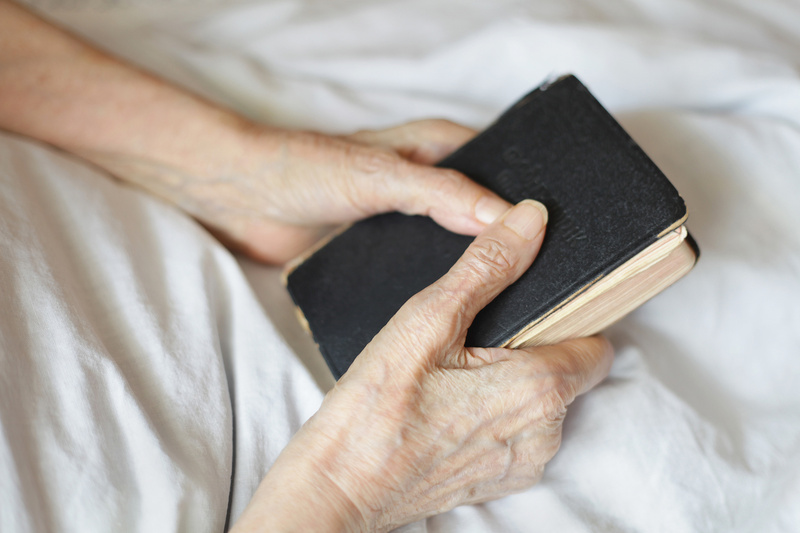 Today about 70% of adults have advanced medical directives in place at the time of their death. This success can be attributed to federal law requiring health care agencies to advise each patient of the right to have an advanced medical directive. As people consider the possible loss of decision-making authority over their health care decisions, it is an easy sell. We live in the world but not like the world (Romans 12:2; 1 Peter 1:17). While the world fears death, Christians desire it without pursuing it. The Apostle Paul put it this way, “I am torn between the two: I desire to depart and be with Christ, which is better by far; but it is more necessary for you that I remain in the body” (Philippians 1:23–24). What makes the Christian different is faith. Scripture tells us, “Faith is confidence in what we hope for and assurance about what we do not see” (Hebrews 11:1). Faith is the miraculous ability to be confident about things you hope for and certain about things you do not see. By the power of God the Holy Spirit, Scripture convinces us of the incredible and the impossible. Through faith we believe God became man and lived among us (John 1). That God-Man, Jesus Christ, lived a life without sin (Hebrews 4:15) and became the perfect sacrifice to pay the price for our sins (2 Corinthians 5:21). That happened on Good Friday on a cross on a hill on the outskirts of Jerusalem. There is more. On the third day following his execution Jesus rose from the dead. He was seen alive by over 500 people. It is a fact of history that is so ancient that precious little tangible evidence exists anymore. It does not make it less real, but it makes faith all the more incredible. We believe in a Savior we never met, who was born of a virgin, lived a perfect life, died a terrible death, and rose from the dead. We didn’t see these things, we have no pictures, and we lack the kind of evidence our cynical world demands. Nevertheless, we believe Jesus is in heaven, reigning with God the Father in a place prepared for us with many rooms (John 14:2). Upon death we will be in heaven with Jesus (Luke 23:43; John 11:25). In contrast to what we know by faith, we see the visible consequences of sin in the world. We see beauty that fades, buildings that deteriorate, and flesh that decomposes to dust. Yet, we desire death knowing the transformation that will occur. The bodies that ache, feel pain, decline, die, and decompose become new bodies like the resurrected body of Christ (Philippians 3:21). Christian bioethics is the only ethical construct in which motive is the first determinant of right or wrong. Christians approach end-of-life decisions with a clear understanding that God owns human life, and we are stewards of it on his behalf. We make decisions to care and protect life as caretakers of this precious commodity belonging to God (1 Corinthians 6:19). We protect life from danger – acting to heal and rehabilitate where we can. Yet, we refuse to fear death. We do what we can with what we have, knowing at all times, God gives life, heals as the ultimate physician, and calls life back to himself. Before we talk about what medical treatment to pursue and whether to sign a DNR (do-not-resuscitate) order; before we get a second opinion, ask our friends, and check out the medical websites; we take health concerns to the Owner of our lives for his input and guidance. We seek out God’s Word for direction and assurances. Two alarming trends are at work today, operating outside of the realm of faith in end-of-life decision-making: the movement to legalize assisted suicide and the growing obsession with transhumanism. Advocates of assisted suicide mask their attempts to legalize murder and self-murder with talk of dignity, compassion, and autonomy. Even though murder and self-murder are clearly forbidden in God’s Word, some Christians are lured by the appeal to take final control of life’s trajectory, to side-step the will of God, and take their own lives. The assisted suicide movement is not a crusade against over-treatment or painful end-of-life experimentation. It is an effort to shake a defiant fist at God in rebellion and demand an entitlement to break his command that forbids murder. It is a rejection of quality and compassionate palliative care, designed to provide comfort and support at life’s end. Instead, its advocates want to kill themselves with poison, they want the doctor to help, and they want you and me to make it legal. In his book, Final Exit, Derek Humphry knew how this suicide recipe book would fare against the Word of God. He wrote, “If you consider God the master of your fate, then read no further. Seek the best pain management available and arrange hospice care.” Even the heathen know people of faith are to stay far away from killing and self-killing. In contrast, transhumanism promises longevity and eventual immortality by the melding of the biological and mechanical. Some talk of “transplanting” consciousness from the biological into the mechanical, in which a computer possesses your memories and character – essentially, perpetuating who you are. Others see technology replacing worn-out body parts. As a cyborg we would continue to grow in knowledge and wisdom as the more durable components of technology replace the frailty of biology. Unlike advocates of assisted suicide, transhumanists look for permanency in this world. In both scenarios God, sin, salvation through Christ, and heaven are wholly dismissed. Must we pull out all the stops and exhaust every resource for treatment? Should we step back, do nothing, and let “nature takes its course” without intervention? These are broad and complicated questions – for now let’s look specifically at the matter of do-not-resuscitate orders. It is important to remember who we are, namely, stewards of God’s gift of life. We are redeemed by holy blood and called to serve God and his will. Paul saw continued life on earth as an opportunity to serve others. Yet, life on this earth ends, and our eternity continues in the perfect realms of heaven. Motive – the reflection of our faith in attitude and actions – becomes a primary guide in making difficult end-of-life decisions. We seek to preserve life, yet we do not fret at the prospect of death. Resuscitation is an effort to revive someone from unconsciousness or near death. Its most typical application is as a medical order placed in one’s medical chart or as an instruction provided in a medical directive statement. Full resuscitation efforts are aggressive combinations of cardiopulmonary resuscitation using CPR (the rapid compression of the chest to “pump” the heart for the continued flow of oxygen in the body) and defibrillation (an electrical shock applied to restart a heart). A DNR order is appropriate when there is no “reasonable” expectation that aggressive resuscitation efforts would succeed. For example, on one extreme a child, youngster, or middle-aged adult could experience an unexpected electrical shock that stops the heart. Assuming there is no other catastrophic damage we would act to resuscitate the patient. The patient’s overall health suggests a reasonable expectation that resuscitation efforts would succeed. On the other extreme, advanced age and other declining physical conditions suggest it is not reasonable to succeed with aggressive resuscitation efforts. That being said, while age strongly suggests the potential success of a resuscitation effort, the overall health of the patient remains the larger factor. In my 30+ years of advising on these matters, I have suggested a resuscitation order for an 85-year-old man who was in exceptional physical shape. It seemed reasonable to expect resuscitation efforts would succeed. I also recommended a DNR order be placed on a 63-year-old woman with advanced dementia and declining kidney and liver function, who had withered to a mere 83 pounds. I did not think it was reasonable that aggressive resuscitation efforts would succeed in restarting her heart. Can we be wrong? Absolutely! In fact, throughout our lives we make many wrong decisions about the way we care for life. Sometimes we eat too much or too little. We eat the wrong kinds of food or not enough of the right kinds. We exercise too hard or not enough. The Christian life is a series of decisions seeking to glorify God in all that we do, nevertheless tarnished by the imperfection of sin. So, yes, we can be wrong – but remember this: God gets his way – always! I have counseled some with decisions that seemed very certain to sustain life, only to have the patient die. I have also counseled in cases that seemed very certain death was inevitable. Yet, weeks later the patient returned home. As Christians we make the best judgments we can based on what we know. We are guided first, however, by our faith in God as our Creator and Redeemer. For that reason, faith-based decision-making involves constant spiritual nurturing with God’s Word and the valued input of our pastors and other strong spiritual acquaintances who help us check our motives to assure our decisions remain laser-focused on glorifying and honoring God. Rev. Robert Fleischmann has been the National Director of Christian Life Resources since 1988. He also serves as the administrative pastor at St. Paul Ev. Lutheran Church in Slinger, WI, and serves as adjunct professor in the bioethics department at Concordia University as well as at Wisconsin Lutheran Seminary in Mequon, WI. He speaks throughout North America on the Biblical approach to various life and family issues and counsels people with God’s Word in correct decision-making.